Match The Fire Extinguisher To The Fire! 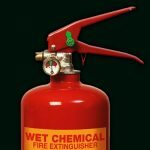 Fire Extinguishers are a basic requirement in all business and residential buildings. 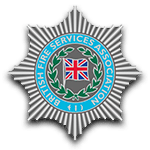 They are used to control or extinguish small fires. It is important that extinguishers are correctly positioned and that they are easy to access in the event of an emergency. However, in the panic of a fire breakout, it can become difficult to know which fire extinguisher to use on a fire. There are 5 main types of extinguisher: Water, Powder, Foam, CO2 and Wet Chemical. Each extinguisher has its own use case depending on what type of fire has broken out. Here is a guide to the different extinguishers and their uses. 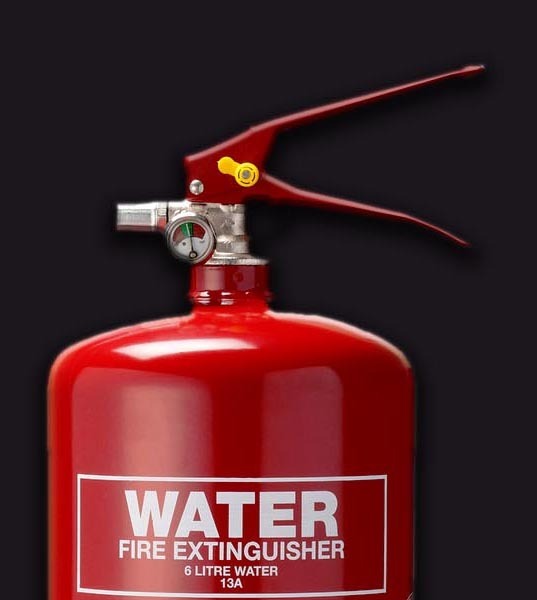 A water fire extinguisher is usually labelled with a white label that says “WATER”. 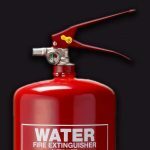 Water fire extinguishers have a class A rating and are safe for use on wood, paper and fabric fires. Water fire extinguishers are NOT suitable for electrical fires as water is a conductor and you are at risk of electrocution if used on this type of fire. They are also NOT suitable for flammable liquids or flammable metal fires as it will not extinguish the fire. In the case of a flammable liquid fire, a water extinguisher will spread the liquid around which can potentially do more harm than good and exacerbate the fire. Water extinguishers are recommended for environments that store large amounts of combustible materials such as warehouses, paper mills and storage facilities. 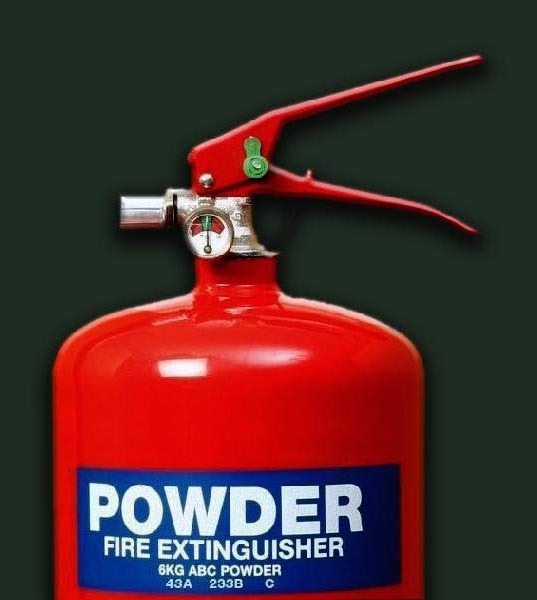 A powder fire extinguisher can be identified by a blue label that says “POWDER”. Powder extinguishers can be used on wood, paper and fabric fires. They can also be used on flammable liquid fires, gaseous fires and even electrical fires. 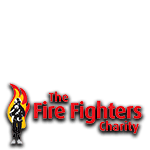 Powder extinguishers CANNOT be used on fires involving cooking oil (such as pan fires), fires involving electrical equipment that exceed 1000v, fires in enclosed spaces, or fires involving flammable metals (unless it is a “specialist” dry powder extinguisher). 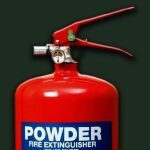 Powder extinguishers are recommended for outdoor environments with a lot of space which involve chemicals, fuels or even vehicles. 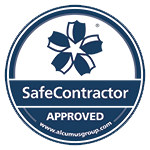 They are suitable for large commercial boiler rooms, large workshops and storage facilities containing flammable liquids. Foam extinguishers are identifiable by a cream coloured label that reads “FOAM”. These can be used for wood, paper and fabric fires. Foam extinguishers are also safe for use on flammable liquid fires. They CANNOT be used on electrical fires or flammable metal fires as this extinguisher could end up exacerbating the fire. 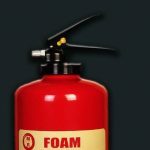 Foam extinguishers are ideal for premises which have multiple fire risks including offices, factories, warehouses and hotels. 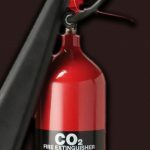 CO2 fire extinguishers can be identified by a black label reading “CO2”. 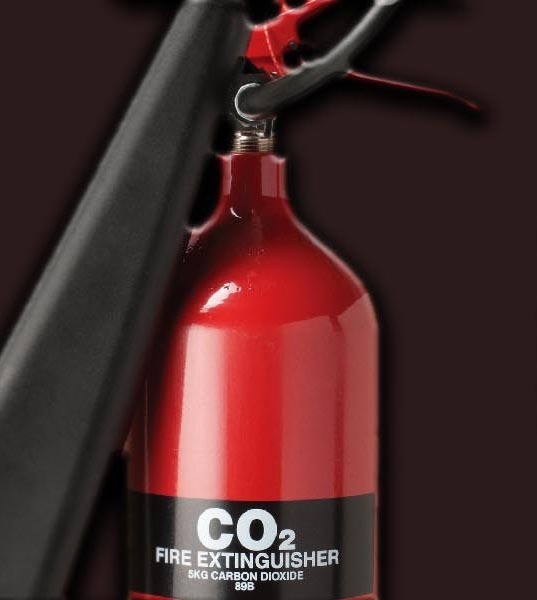 CO2 fire extinguishers are safe for use on flammable liquid and electrical fires. They are NOT for use on wood, paper or fabric fires. They are also NOT suitable for cooking fires that involve oil and grease (such as chip pan fires) as the extinguisher could end up blasting the flames into surrounding areas. It is also NOT recommended that the user holds the extinguisher by the horn as the CO2 becomes very cold when it evaporates into a gaseous state upon leaving the extinguisher and can cause cold burns. Unlike foam and water extinguishers, CO2 extinguishers don’t work by cooling the fire but instead replacing the oxygen around the fire with Carbon Dioxide meaning the fire can no longer burn. CO2 extinguishers should be compulsory for premises with electrical fire risk such as offices, schools and shops. 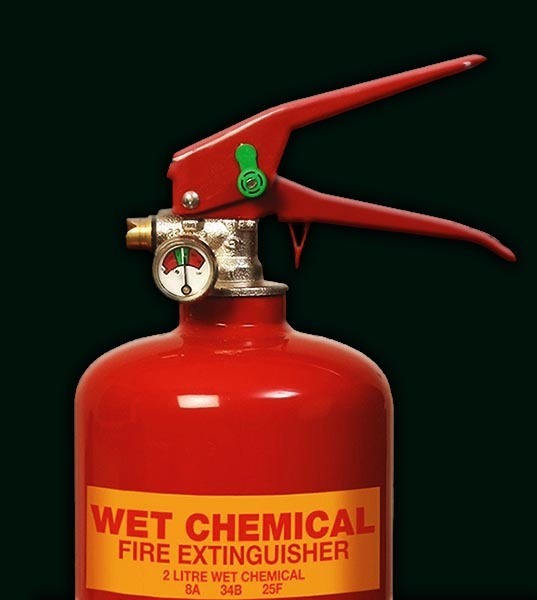 A wet chemical fire extinguisher can be identified by a yellow label that states “Wet Chemical”. Wet chemical extinguishers can be used on wood, paper and fabric fires. They are also safe for cooking and deep fat fryer fires. They are NOT suitable for electrical, flammable liquid or gaseous fires as it could end up escalating the fire. Wet chemical extinguishers should only be used in well-ventilated areas as they produce toxic fumes that should not be breathed in. Wet chemical extinguishers are necessary for any premises with a professional kitchen and deep fat fryer such as restaurants, burger bars and hotels. 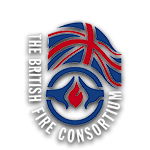 If you require fire extinguishers for your premises, would like annual fire extinguisher servicing, or more advice on which fire extinguishers your premises require, contact Fire Guard Services today on 01582 469000 or email us at sales@fireguardservices.com.